Firedragon Games has a wealth of experience, technical know-how and artistic ability that is ideally suited to give a bespoke service to individuals and small businesses. We can undertake mould making and casting for resin and white metal, model making, scenery building and painting all to a very high standard. Having all this under one roof is ideal, especially if you are just starting out or taking the plunge with a Kickstarter campaign. We can mould, cast, paint and even provide a scenic setting to promote your models and help them stand out from the crowd... and you will only need to deal with one company with no sub-contractors. Check out more details below of the services we offer and get in touch to talk to us about your project. Our many years of experience in mould making includes a diverse range of projects, from replica car parts, pewter giftware and jewellery, media industry awards and of course wargames miniatures. Master and production moulds are made using high quality silicone. We can advise you on all aspects of the mould making process including where to make separations on your model if needed. If your model needs cuts, connections or repair work we can also do that. Production Mould (9" silicone) £60.00. Set of metal master castings £45.00. Whether it's a simple open mould or a complex cut mould we make them all to the same high standard offering the finest detail reproduction available. As with metal casting moulds, we can advise on, and undertake, cutting models into separate parts if required. Prices begin at £25.00 and are dependent on size of mould and complexity. Miniatures from EMP Games and Titan Wargames. Metal casting in lead alloy or lead-free pewter offers excellent detail reproduction and affordability. Combined with our mould making expertise we can provide castings that are highly detailed and with minimal mould lines and sprue marks. There is no minimum casting order size and the castings are priced per unit making your costings very easy to calculate. If you want the very best detail reproduction then resin casting is the option to go for. 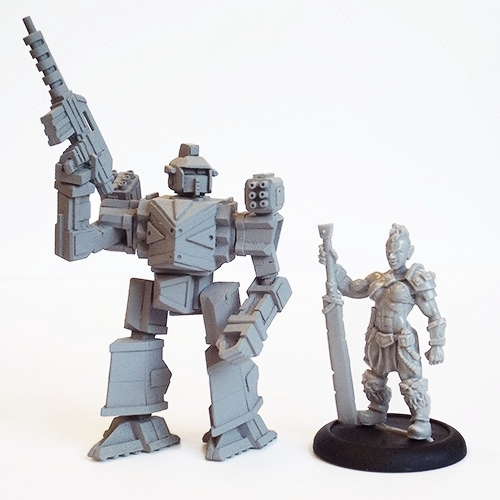 It is also light, so ideal for larger miniatures where the weight of the miniature could add significantly to shipping costs. We use polyurethane resin with vacuum and pressure casting to give clean, bubble free castings. As well as standard resin casting for miniatures and kits we can produce items using fillers to create different finishes including bronze and brass metallic effects. 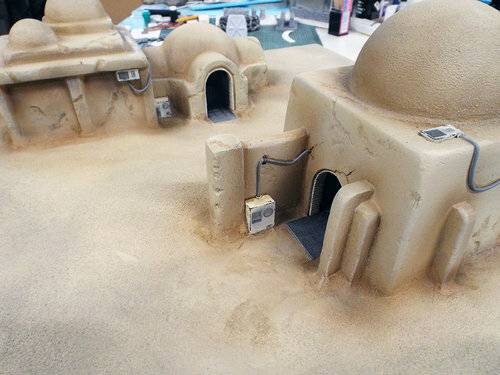 Do you want a custom scenery piece, anything from a single building or hill to a complete wargames table? We can make it for you. We can convert 2D boardgame boards and RPG maps into spectacular 3D gaming settings. If you don't have the time to build and paint scenery kits let us do it for you. Not only will it save you time, we can also make your basic kits look amazing by adding our own custom parts and using paint effects. City Gate - 28mm Styrofoam building for table edge.